In a competitive global economy, your solar company has to constantly be on the look-out for new customers. Whether you’ve entertained the idea of exporting wholesale solar equipment, or you are seriously working on an international sales strategy, you need to be ready when opportunity comes knocking. Opportunity to sell abroad can present itself on any given day. For instance, it’s common to meet prospective foreign buyers at trade shows and other networking events. A few months ago, my company, EnergyBin, exhibited at The Energy Expo in Miami. This trade show spotlighted the latest and greatest technology in the renewable energy industry. Businesses from 40 countries throughout Latin America and the Caribbean attended the event to network with U.S. companies. Q. How can you be ready to take advantage of this opportunity? You could also discover new opportunities to sell to foreign buyers via your e-commerce website. With the advent of internet shopping, more buyers are turning to online marketplaces to find what they need. For example, we’re seeing more and more foreign solar companies searching for hard-to-find replacement parts on EnergyBin because these parts aren’t available in their local markets. Q. How is your company prepared to handle a transaction with a foreign buyer? To answer these and other questions you may have concerning exporting, let’s take a look at three resources designed to help U.S. companies gain international opportunities. Whether you are new to exporting or an experienced professional, there’s always more to learn to stay on top of your game. 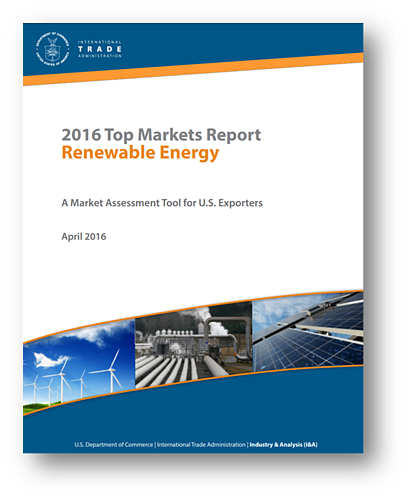 Here are three resources that every U.S. solar equipment exporter should know and use. The International Trade Administration (ITA) offers a wealth of research on markets and industries. This governmental entity is meant to strengthen the competitiveness of the U.S. industry. ITA promotes trade and investment. It further ensures fair trade by enforcing trade laws and agreements. A lot has happened in the solar industry since the Top Markets Report – Renewable Energy was last updated in April 2016. But it still offers a wealth of information for US solar exporters. The report gives an overview of the top ten solar export markets and a solar energy sector snapshot complete with opportunities and challenges for exporters. The Market Diversification Tool is a great starting point for research into potential export markets. You’ll get trade statistics for each country result matched to your Harmonized System (HS) code(s). Try it out with the HS code for solar cells (854140). You’ll get results that look similar to the below image. 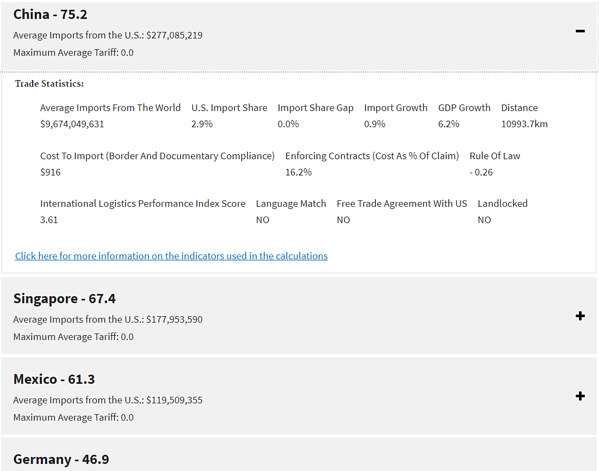 You can expand each result to view details on such statistics as U.S. import share, cost to import, and the international import logistics performance index score. Note that the data provided is an average that spans five years and no less than three years. In other words, it is not annual data. But again, it’s a good way to get a quick snapshot of opportunities in foreign markets. Once you get a big-picture idea of the opportunities that exist for U.S. solar exports from the ITA site, you’ll want to dig deeper into your research. 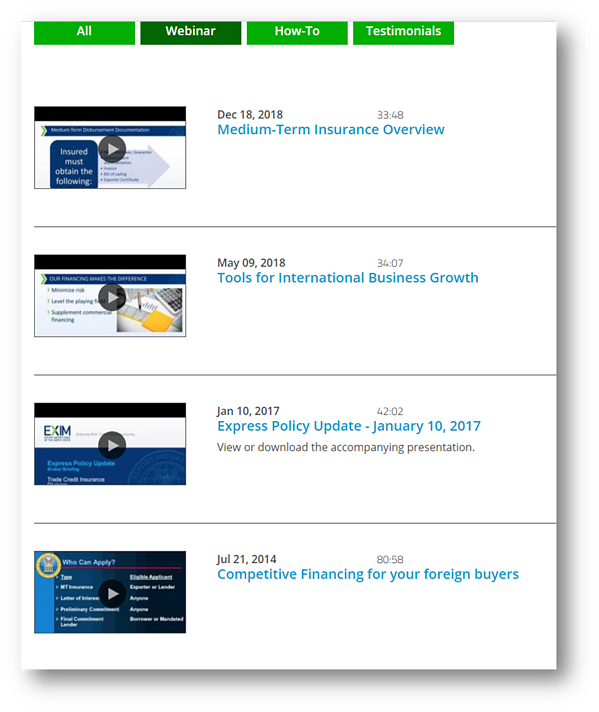 Navigate to Export.Gov to access helpful tools for planning, developing and executing your company’s international sales strategies. Export.Gov is the brainchild of the ITA. It was developed by international trade specialists and economists. The site offers a wealth of market intelligence, practical advice and business tools that explain how to export, connect with foreign buyers and expand into new markets. 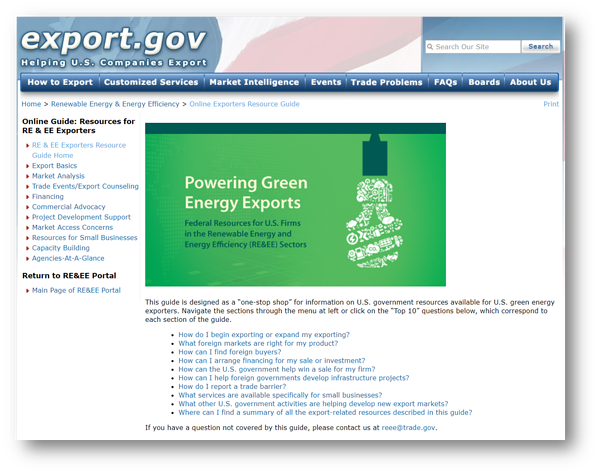 This portal is a great resource for industry-specific export issues. Start by reading through each of the FAQs for RE&EE Exporters. These top 10 questions are presented in a way to walk you through the full array of U.S. government resources available to you. It is a quick and easy way to get acquainted with the portal. 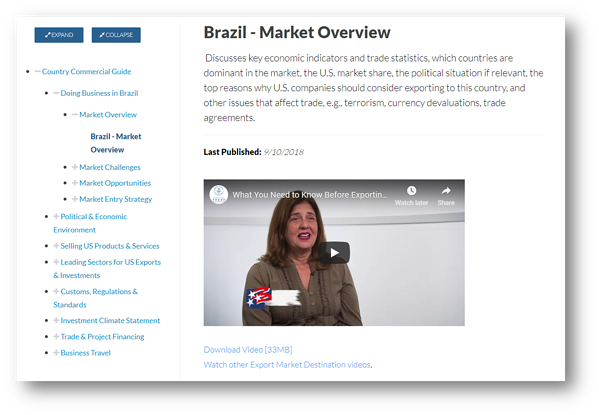 Under the How to Export section, you’ll find educational information to create, refine and grow your international strategy. Treat these resources as a worksheet to prepare for exporting. The learning center walks you through a basic guide to exporting. Learn how to get ready to export. Plan your market entry strategy. Explore how to find foreign buyers. Address the issues of getting paid and financing your export transactions. Study the logistics of the export sale. And discover how to manage challenges effectively. If you’re looking for a crash course in doing business in a specific country, look up the Country Commercial Guide. Export.Gov provides information on market conditions, opportunities, regulations and business etiquette for more than 125 countries. Start by watching the video overview for a selected country. May I suggest Brazil, one of the top markets spotlighted in ITA’s Top Markets Report? The video provides insights from Rick Ortiz, Senior Commercial Officer, and Teresa Wagner, Commercial Specialist, who both work with U.S. Commercial Services offices in Brazil. Then, browse through all the topics and subtopics on the left margin. You’ll learn valuable information that will strengthen your strategy to expand into a new market. For instance, clicking on the topic – Selling US Products & Services – and then on the subtopic – Using an Agent, you’ll see that it is vital to work with a local agent or distributor in Brazil. Further, country experts recommend exporters consult with a Brazilian legal representative before writing and signing agreements. Export.Gov users receive free access to the CUSTOMS Info database. This is a practical tool to help you further understand the barriers you will face in a particular market, such as tariffs and value-added tax (VAT) rates. You can look up tariff information for shipments that originate and ship from the U.S. to any country listed in the database. Fill out the CUSTOMS Info Global Tariff Registration Form to create your free account. The form only requires a valid email address and your residing state. Arguably the best reason for visiting the Export.Gov website is to register for customized services with the U.S. Commercial Service. Trade experts help U.S. companies identify markets, industries and buyers around the world that are most likely your best prospects. A total of 108 U.S. offices work to connect companies to country experts in 130 U.S. embassies and consulates around the world. 1. You will be asked to share about your business and the criteria you’re looking for in a buyer. 2. They will conduct research for you based on your preferences to determine where international opportunities exist. 3. They’ll put together a list of potential buyers and partners in your most promising foreign markets. 4. They can schedule video or conference call meetings for you and your prospective buyers, partners and/or country experts. 5. They can also plan in-person meetings, and if you prefer, they’ll go with you to the meetings. They can arrange for a local interpreter if needed. Other available services can be customized to fit your company’s specific needs. There is a nominal fee for each service. To begin working with the U.S. Commercial Service, contact the office nearest you. When you are ready to pull the trigger on your company’s international sales strategic plan, you can take further steps to minimize your risk. Check out how the Export-Import Bank of the United States (EXIM) can help you with risk reduction. As the official U.S. export credit agency, EXIM works to empower U.S. exporters to increase sales abroad. EXIM supports the purchase of U.S. goods and services by creditworthy international buyers who cannot obtain credit through traditional trade finance sources. EXIM helps to level the playing field for U.S. exporters by matching the financing that other governments provide to their exporters. Specific to renewable energy, EXIM is mandated by Congress to support renewable energy exports and has allocated 10% of its authorizations for such transactions. Protect against buyer nonpayment – When you are unsure about the financial stability of a newfound foreign buyer, you can protect yourself with EXIM’s export credit Insurance. This insurance plan kicks in when the foreign buyer defaults due to an unforeseen bankruptcy or foreign policy issue. You can obtain policies that cover your full export portfolio, a few buyers, or just a single buyer. Provide financing – If you are struggling to finance your global growth, EXIM may have a solution for you. For instance, EXIM may guarantee a loan with your private lender that would repay a percentage of the loan if you default. Or, EXIM may provide an insurance policy for your foreign accounts receivable to protect you from buyer nonpayment. Such an arrangement may help you secure a loan from a private lender. Sell to foreign customers on credit terms – To protect yourself against commercial and political risks that are out of your control, EXIM can help by providing export credit insurance. This insurance policy reimburses you for 85-95% of your sales invoice amount in the event that your buyer fails to pay. Borrow against export-related assets – When you borrow against your inventory and accounts receivable, you free up cash flow. EXIM’s export credit insurance and working capital loan guarantee are designed to support you in borrowing against your assets. Issue performance and bid bonds – Say your buyer demands a standby letter of credit in the form of a bid or performance bond in order to award your company a contract. Since lenders require cash as collateral to issue such a bond, it depletes cash-on-hand. EXIM’s working capital loan guarantee can help alleviate the need to tie up your cash. Finance a foreign buyer’s purchase – If your prospective buyer is dissuaded from dealing with you because of expensive borrowing rates in their home country, EXIM can help. It is possible for EXIM to provide a loan guarantee to a U.S.-based commercial lender for the buyer to access affordable credit. Services exports – EXIM even assists companies with services sold abroad, including engineering and freight forwarding. If you are an EPC consultant or solar broker who is expanding into foreign markets, you may find it helpful to meet with an EXIM representative to arrange safeguards against the risks of doing business abroad. Aside from helping with these issues, EXIM has a number of webinars and how-to videos covering various exporting topics. Viewing these videos is a good way to get acquainted with EXIM before you reach out to an EXIM representative. They are meant to give an overview of EXIM as well as answer frequently asked questions regarding export services. View all topics in the webinar archive. As renewable energy continues to take the world by force, consider how your company can take advantage of new business opportunities abroad. We’ve covered three essential resources that provide the learning tools and services you need to be a successful U.S. solar exporter. Dive in and explore how the International Trade Administration, Export.Gov and EXIM can help your solar business go global. Want to learn more about wholesale solar equipment brokering? Check out more resources here.